Work faster and more efficiently by using the Inventor keyboard commands and shortcuts below. 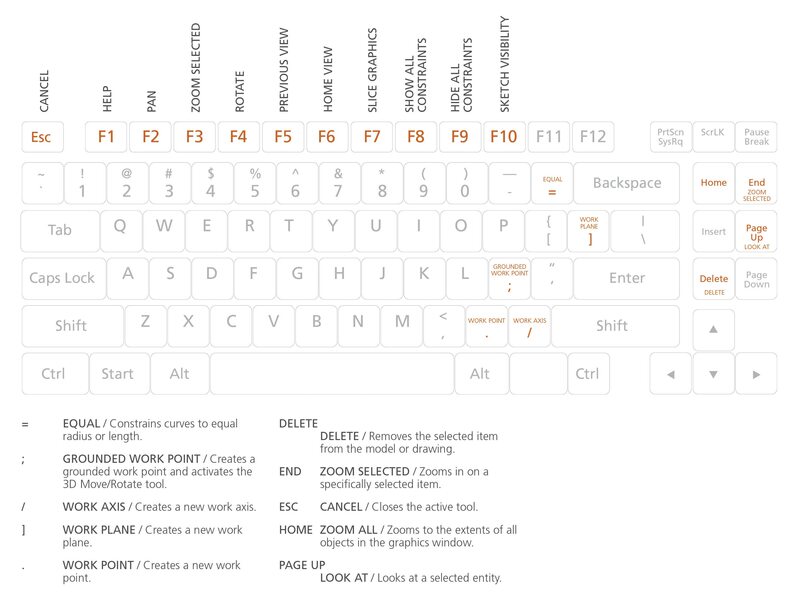 You can find a downloadable list of shortcuts and commands in the Inventor Keyboard Shortcuts PDF. Below, you'll find the Inventor one-key shortcuts. Click on the image for a larger view. Below, you'll find an abbreviated list of commands that can be used in Inventor. ALT-DRAG MOUSE MATE CONSTRAINT / Applies a mate constraint. CTRL-H REPLACE COMPONENT / Replaces one assembly component with another component. SHIFT-TAB PROMOTE / Removes a part from a subassembly and makes it an individual part in the parent assembly. CTRL-D OPEN DRAWING / Opens drawing. ALT-T TOGGLE TRANSPARENT STATE / Toggles transparency. ALT-V VISIBILITY / Changes the visibility of an assembly component in the graphics window. CTRL-SHIFT-N NEW SHEET / Inserts a new drawing sheet. CTRL-SHIFT-T LEADER TEXT / Adds notes with leader lines to a drawing. ALT-C CREATE DRAWING VIEW / Creates a new drawing view. CTRL-C COPY / Copies selected items. CTRL-N NEW / Displays the New File dialog box. to open an existing file. CTRL-P PRINT / Displays the Print dialog box. CTRL-S SAVE / Displays the Save As dialog box. CTRL-X CUT / Cuts selected items. CTRL-Z UNDO / Undoes the effects of commands. be selected, then use F2 to enter rename mode. CTRL-SHIFT-K CHAMFER / Activates the Chamfer tool. CTRL-SHIFT-L LOFT / Activates the Loft tool. CTRL-SHIFT-M MIRROR / Activates the Mirror tool. CTRL-SHIFT-O CIRCULAR PATTERN / Opens the Circular Pattern dialog box. CTRL-SHIFT-R RECTANGULAR PATTERN / Opens the Rectangular Pattern dialog box. CTRL-SHIFT-S SWEEP / Activates the Sweep tool. = EQUAL / Constrains curves to equal radius or length. F7 SLICE GRAPHICS / Slices away temporarily the portion of the model that obscures the plane. F8 SHOW ALL CONSTRAINTS / Displays all constraints. F9 HIDE ALL CONSTRAINTS / Hides all constraints. CTRL-R ORTHO MODE / Toggles Ortho Mode (3D Sketch only). CTRL-D DYNAMIC DIMENSION / Toggles Dynamic Dimension (3D Sketch only). CTRL-SHIFT-P SNAP OBJECT / Toggles object snap on and off (3D Sketch only). CTRL-I INFER CONSTRAINTS / Toggles apply constraints on and off. ALT-F8 MACROS / Opens the Macros dialog box. ALT-F11 VISUAL BASIC EDITOR / Launches the Microsoft Visual Basic Editor. ALT-A Switch browser pane forward. ALT-S Switch browser pane backward. ESC CANCEL / Closes the active tool. F1 HELP / Opens the Inventor help files. ALT-. USER WORK POINTS VISIBILITY / Makes work points visible. ALT-] USER WORK PLANE VISIBILITY / Makes work planes visible. ALT-/ USER WORK AXES VISIBILITY / Makes work axes visible. CTRL-. ORIGIN POINTS VISIBILITY / Makes the default origin points visible. CTRL-] ORIGIN PLANE VISIBILITY / Makes the default origin planes visible. CTRL-/ ORIGIN AXES VISIBILITY / Makes the default origin axes visible. CTRL-0 TOGGLE SCREEN / Toggles screen. CTRL-SHIFT-E DEGREES OF FREEDOM / Displays degrees of freedom. CTRL-SHIFT-Q IMATE GLYPH / Activates the iMate Glyph tool. CTRL-W STEERING WHEELS / Displays the Steering Wheel view tool. END ZOOM SELECTED / Zooms in on a specifically selected item. F4 ROTATE / Rotates objects in the graphics window. F5 PREVIOUS VIEW / Returns to the last display. F6 HOME VIEW / Rotates objects in the graphics window into an isometric orientation. F10 SKETCH VISIBILITY / Makes sketches visible. HOME ZOOM ALL / Zooms to the extents of all objects in the graphics window. PAGE UP LOOK AT / Looks at a selected entity. SHIFT-F3 ZOOM WINDOW / Zooms to the area you define with a window. SHIFT-F5 NEXT VIEW / Advances to the next view. SHIFT-MIDDLE MOUSE CLICK ROTATE / Rotates a model. ; GROUNDED WORK POINT / Creates a grounded work point and activates the 3D Move/Rotate tool. / WORK AXIS / Creates a new work axis.
] WORK PLANE / Creates a new work plane.
. WORK POINT / Creates a new work point. Below, you'll find an abbreviated list of commands that can be used on Inventor. BA UTO BALLOON / Creates one or more item balloons used to identify components in drawing views. CAT CATERPILLAR / Adds a weld caterpillar annotation. CB CENTRELINE BISECTOR / Adds a centreline bisector. CL CENTRELINE / Adds a centreline. CM CENTRE MARK / Adds a centre mark. DI DATUM IDENTIFIER SYMBOL / Adds a datum identifier symbol. EF END FILL / Adds a weld end fill annotation in a drawing view or on a 3D weld bead to represent the hatched or filled region indicating the end of a weld bead. F FEATURE CONTROL FRAME / Places a feature control frame in drawing files. FI FEATURE IDENTIFIER SYMBOL / Adds a feature identifier symbol. HTF HOLE TABLE-FEATURES / Selects feature set (all punch centre instances from a single feature). HTS HOLE TABLE-SELECTION / Selects recovered punch centres individually. HTV HOLE TABLE-VIEW / Adds a hole table to a view. LE LEADER TEXT / Adds notes with leader lines to a drawing. PL PARTS LIST / Creates a parts list. RT REVISION TAG / Adds revision tags to a drawing. RTB REVISION TABLE / Creates a revision table. ST SURFACE TEXTURE SYMBOL / Adds a surface texture symbol. SY SYMBOLS / Adds sketched symbols to a drawing sheet. T TEXT / Activates the text tool in a drawing file. TB TABLE / Creates a table. WS WELDING SYMBOL / Provides annotation and acts as a grouping mechanism by referencing multiple beads with a single welding symbol. C CONSTRAINTS / Adds an assembly constraint. CO COPY COMPONENTS / Creates a copy of the component. G ROTATE COMPONENT / Activates the Rotate tool. IA ANALYSE INTERFERENCE / Analyses assemblies for interference. MI MIRROR COMPONENTS / Creates a mirror component. N CREATE COMPONENT / Displays the Create In-Place Component dialog box. P PLACE COMPONENT / Places a component in the current assembly. PC PATTERN COMPONENT / Selects one or more components to include in the pattern. RA REPLACE ALL / Replaces all occurrences of the component in the current assembly. V MOVE COMPONENT / Activates the Move Component command. AR AUTOMATIC ROUTE / Automatically routes one or more selected wires into segments based on the shortest path through the network and the segment opening that is closest to the wire start and endpoints. BR CHECK BEND RADIUS / Checks for bends that do not meet the specified minimum bend radius on segments, and routed and unrouted wires and cables in the active harness assembly. BS BROKEN SKETCH ENTITY / Sets the start point and endpoint for the length to remove from the cable, wire, or segment. CA CONNECTOR AUTHORING / Adds Cable and Harness-specific data to complete the definition of connectors for use in Cable and Harness. CC CREATE CABLE / Creates a cable containing multiple wires that are connected or terminated to selected pins within a harness assembly. CF CREATE FOLD / Creates fold. CR CREATE RIBBON CABLE / Creates a ribbon cable between a start and end connector. CS CREATE SEGMENT / Creates a harness segment. CV PLACE CONNECTOR VIEWS / Places connector views. CW CREATE WIRE / Creates a wire between selected pins within a harness assembly. E EDIT / Edits nailboard sketch. EH EXPORT HARNESS DATA / Exports harness data. F FAN IN / Collapses wire stubs on top of one another to reduce the detail or clutter in nailboard documentation. FO FAN OUT / Equally distributes wire stubs about the endpoint of a segment using the specified angle and sorting direction. HA CREATE HARNESS / Adds the harness subassembly to an assembly file with the specified name and location, and displays the Cable and Harness tab. HD HARNESS DIMENSION / Adds a driven, aligned dimension between 2 points. HP HARNESS PROPERTIES / Custom properties of harness components. IH IMPORT HARNESS DATA / Imports harness data. L CABLE & HARNESS LIBRARY / Adds new library definitions, and modifies, copies, and deletes existing library definitions for harness objects such as wires, cables, raw ribbon cables, and virtual parts. NB NAILBOARD / Specifies the harness assembly and setup to create or edit a nailboard view. P PLACE PIN / Places a pin. * PD PROPERTY DISPLAY / Displays properties for the selected objects. PG PLACE PIN GROUP / Automatically places multiple pins with the specified naming, configuration, and orientation on a part. RG REPORT / Process reports for the active harness assembly. RH REVIEW HARNESS DATA / Reviews harness data. RT ROUTE / Routes cables and wires manually. RW RECONNECT WIRE PINS / Reconnects wire pins. SP CREATE SPLICE / Creates a splice. TB TABLE / Creates a table. U UNROUTE / Unroutes selected wires from selected segments. V ASSIGN VIRTUAL PARTS / Assigns virtual parts. BD BASELINE DIMENSION / Adds baseline dimensions. BN BEND NOTES / Creates or edits a bend note. CN CHAMFER NOTE / Adds a chamfer note to a drawing view. D GENERAL DIMENSION / Adds a dimension to a sketch or drawing. HN HOLE/THREAD NOTES / Adds a hole or thread note with a leader line. O ORDINATE DIMENSION SET / Activates the Ordinate Dimension Set command. OD ORDINATE DIMENSION / Adds an ordinate dimension. PN PUNCH NOTES / Creates a punch note. AV AUXILIARY VIEW / Places an auxiliary view by projecting from an edge or line in a parent view. B BALLOON, BOM / Activates the Balloon tool or displays the BOM Properties dialog box, depending on the work environment. BV BASE VIEW / Creates a base view. BRV BREAK / Creates a broken, foreshortened view. BO BREAK OUT / Removes a defined area of material to expose obscured parts or features in an existing drawing view. CR CROP / Use to set boundary type and visibility of crop cut lines for crop operations. DV DETAIL VIEW / Provides circular and rectangular shapes of detail profile. PV PROJECTED VIEW / Creates a projected view. RD RETRIEVE DIMENSIONS / Retrieves model dimensions in a drawing. SV SECTION VIEW / Creates a section view. AVI PUBLISH MOVIE / Creates AVI animation. CC CONVERT ASSEMBLY CONSTRAINTS / Converts assembly constraints. CSA PUBLISH TO STUDIO / Creates studio animation. DM DYNAMIC MOTION / Dynamic part motion. F FORCE / Applies force on the selected objects. FEA EXPORT TO FEA / Exports to FEA. J INSERT JOINT / Inserts joint. MS MECHANISM STATUS AND REDUNDANCIES / Provides model status information and guides you through the process of repairing redundant constraints. OG OUTPUT GRAPHER / Displays graphs and numerical values of all the input and output variables in a simulation during and after the simulation completes. RF REFERENCE FRAME / Creates a Reference Frame from the input provided. SET DYNAMIC SIMULATION SETTINGS / Sets options that apply to the entire Dynamic Simulation session. TO TORQUE / Applies torque on the selected objects. TR TRACE / Creates the absolute or relative kinematic values (trajectory, velocity, and acceleration) of one or more points placed anywhere on a component. A ANIMATE RESULTS / Animates the selected simulation results. AM AXIAL MOMENT / Adds an axial moment. B PROBE / Displays the simulation results for a specific point on the model. BC BOUNDARY CONDITIONS / Toggles display of all boundary conditions. BD BEAM DETAIL / Displays detailed results (diagrams, tables) for the selected beams of a structure. BM BENDING MOMENT / Applies the bending moment to the selected beam. C CREATE SIMULATION / Creates a simulation. CB COLOUR BAR / Edits colour bar. CL CONTINUOUS LOAD / Applies and distributes uniform load along the beam you select. D DIAGRAM / Adds custom user diagram. EX EXPORT / Exports to robot structural analysis. F FORCE / Applies a force of the specified magnitude to the selected faces, edges, or vertices. FL FLOATING PINNED CONSTRAINT / Adds floating pinned constraint. LB BEAM LABELS / Toggles display of beam labels. LN NODE LABELS / Toggles display of node labels. LP PROBE LABELS / Toggles visibility of probe labels. LS LOCAL SYSTEMS / Toggles display of beam local systems. LV LOAD VALUES / Toggles display of load values. MA BEAM MATERIALS / Enables you to change the material of the beam. MO MOMENT / Applies the general moment to the selected beam. N NO SHADING / Turns off the Shaded Results display. P BEAM PROPERTIES / Provides physical and engineering properties of a frame member, and enables you to customize the data. PN PINNED CONSTRAINT / Applies pinned constraint when no displacement and free rotation is allowed on beam or node. R REPORT / Generates a report. RE RELEASE / Assigns a release of specified degrees of freedom to a selected beam in a structure. RL RIGID LINK / Enables you to define a rigid link between selected nodes in a frame structure. S SIMULATE / Runs a simulation. X FIXED CONSTRAINT / Applies a fixed constraint on selected faces, edges, or vertices. 2D 2D DRAWING / Creates one or more drawing documents. AM ANIMATE RESULTS / Animates the selected simulation results. AO ADJUST ORIENTATION / Prompts the Adjust Orientation dialog box. AP ADJUST POSITION / Prompts the Adjust Position dialog box. AR AUTO RUNNER SKETCH / Creates an auto runner sketch. AU MOLD BASE AUTHOR / Assigns component attributes before inserting a user defined mold base. BC BRIDGE CURVE / Connects curves by G2 continuity. BL MOLD BOOLEAN / Integrates the interference checking function and the Boolean calculation. BR BOUNDED RUNOFF SURFACE / Creates a runoff surface. CD CORE/CAVITY / Core/Cavity design and analysis environment. CI CREATE INSERT / Creates an insert. CM COMBINE CORES AND CAVITIES / Creates, edits, or deletes a combined core or cavity. CP PLACE CORE PIN / Places a core pin into a mold. CS COOLING COMPONENT / Specifies the components that conduct the coolant through the cooling channels. CW COLD WELL / Defines the cold wells that are at the end of the sprue or on a runner. DW DEFINE WORKPIECE SETTING / Enables you to generate a rectangular or cylindrical workpiece, which is the precondition for generating the core and cavity. EJ EJECTOR / Creates an ejector pin to eject a plastic part. EM EDIT MOLDABLE PART / Edits a moldable part. ES USE EXISTING SURFACE / Creates, edits, or deletes the existing patching or runoff surface. 1 TOGGLE SMOOTH / Activates the toggle smooth command. E EDIT FORM / Edits an existing form to add, remove, or modify controls. CH CHAMFER / Creates a chamfer. DE DIRECT EDIT / Allows you to make quick edits to existing solids. F FILLET / Creates a fillet in part and assembly files. GW GROOVE WELD / Creates a groove weld feature in a weldment assembly that connects two face sets with a solid weld bead. MI MIRROR / Creates a mirror feature. Q CREATE IMATE / Displays the Create iMate dialog box, for developing iMates. RP RECTANGULAR PATTERN / Creates rectangular pattern of feature. S 2D SKETCH / Activates the 2D Sketch command. S3 NEW SKETCH / Activates the 3D Sketch command. SH SHELL / Removes material from a part interior, creating a hollow cavity with walls of a specified thickness. TH THREAD / Creates threads in holes or on shafts, studs, or bolts. W FILLET / Activates the Fillet tool. WS WELDING SYMBOL / Provides annotation and acts as a grouping mechanism by referencing multiple beads with a single welding symbol. CV CREATE VIEW / Adds a new presentation view. T TWEAK COMPONENTS / Tweaks components in a presentation. BE BEND / Creates a bend. CC CORNER CHAMFER / Activates the corner chamfer command. CF CONTOUR FLANGE / Creates a contour flange. CR CORNER ROUND / Adds fillets or rounds to one or more corners of a sheet metal part. CS CORNER SEAM / Defines the corner seams you add to sheet metal faces. FA FACE / Creates a sheet metal face. FO FOLD / Defines the fold in a sheet metal face along a sketched line that terminates at face edges. HEM HEM / Creates a folded hem along sheet metal edges. PT PUNCHTOOL / Defines the punch of a 3D shape into a sheet metal face. ST SHEET METAL DEFAULTS / Changes the options and parameters for the active sheet metal part from those options defined by the selected Sheet Metal Rule. A BASELINE SET, ANIMATE, ARC / Activates the Baseline Set, Animate, or Arc tool, depending on the work environment. A3 THREE POINT ARC / Draws a three-point arc using dynamic input. AD AUTO DIMENSION / Prompts the Auto Dimension dialog box. CE CENTRE POINT CIRCLE / Draws a centre point circle using dynamic input. CP CIRCULAR PATTERN / Creates circular pattern of sketch geometry. EL ELLIPSE / Creates an ellipse with a centre point, a major axis, and a minor axis that you define. EX EXTEND / Makes surfaces larger in one or more directions. FI FILLET / Adds fillets or rounds to one or more edges of a part, between two face sets, or between three adjacent face sets. H FILL/HATCH SKETCH REGION / Hatches or colour fills an enclosed boundary in a drawing sketch. I VERTICAL / Activates the vertical constraint tool. L LINE / Creates a line or arc. MI MIRROR / Mirrors sketch geometry about a selected plane. MO MOVE / Moves selected sketch geometry from point to point, or move a copy of the geometry. O OFFSET / Duplicates selected sketch geometry, and positions it an offset distance from the original. PO POINT, CENTRE POINT / Sketches points and centre points. POL POLYGON / Creates polygon shapes. REC TWO POINT RECTANGLE / Draws a two-point rectangle using dynamic input. REC3 THREE POINT RECTANGLE / Draws a three-point rectangle using dynamic input. RO ROTATE COMPONENT / Activates the Rotate Component command. RP RECTANGULAR PATTERN / Creates rectangular pattern of sketch geometry. SP SPLINE / Creates a spline. TC TANGENT CIRCLE / Creates circle tangent to three lines. X TRIM / Activates the Trim command. BP BEND PART / Bends a portion of a part. E EXTRUDE / Extrudes a profile. H HOLE / Creates a hole in a feature. LO LOFT / Creates lofted features or bodies by blending multiple profiles into smooth shapes between the profiles or part faces. R REVOLVE / Revolves a sketch. SW SWEEP / Creates a sweep feature. AC AUTOMATIC CONTACTS / Compares automatic contacts. BE BEARING LOAD / Applies a bearing load to a full or partial cylindrical surface. BO BODY LOAD / Defines angular velocity or angular or linear acceleration for the model. CC COLOUR BAR / Displays the Colour Bar settings dialog box where you adjust the colour bar display parameters. CF FIXED CONSTRAINT / Applies a fixed constraint on selected faces, edges, or vertices. CS FRICTIONLESS CONSTRAINT / Applies a frictionless constraint on selected faces. CT CONTOUR SHADING / Displays colour changes using a strict banding between colours. FO FORCE LOAD / Applies a force of the specified magnitude to the selected faces, edges, or vertices. GR GRAVITY LOAD / Creates a gravity load. MAT ASSIGN MATERIALS / Opens the assign materials dialogue box to assign materials to a component. MAX MAXIMUM RESULT / Turns on and off the display of the point of maximum result in the mode. MC MANUAL CONTACT / Adds manual contact conditions to selected geometry elements. MIN MINIMUM RESULT / Turns on and off the display of the point of minimum result in the model. ML LOCAL MESH CONTROL / Adds a local mesh control. MO MOMENT LOAD / Applies a load of the specified magnitude around the axis and perpendicular to the face. MS MESH SETTINGS / Specifies the mesh sizing and coarseness. MV MESH VIEW / Displays the element mesh used in the solution with the result contours. Also displays the mesh over the undeformed model. N CREATE SIMULATION / Creates new simulation. NP NO SHADING / Turns off the Shaded Results display. P PROBE / Activates the Probe command. You place probes as needed in areas of interest to display the stress values for that point. PL PROBE LABELS / Toggles the visibility of probe labels. PR PRESSURE LOAD / Pressure load. RF REMOTE FORCE LOAD / Applies a force of the specified magnitude to the selected face. SC RESULT DISPLACEMENT SCALE / Adjusts displacement scale. SET STRESS ANALYSIS SETTINGS / Activates the stress analysis settings dialog box. SM SMOOTH SHADING / Displays colour changes using a blended transition. SS SAME SCALE / Maintains the same scale while viewing different results. T PARAMETRIC TABLE / Accesses the parametric table to specify design constraints and parameter ranges. LA EDIT LAYERS / Specifies a layer name and attributes for common display properties of drawing objects. M MEASURE DISTANCE / Opens the Measure Distance window. OP APPLICATION OPTIONS / Opens the Application Options settings. SE EDIT STYLES / Style and Standard Editor. AT TUBE & PIPE AUTHORING / Authors an iPart or a normal part for publishing to the Content Centre Library. CF CONNECT FITTINGS / Connects existing fittings. DR DERIVED MOTION / Creates or edits a derived route. ES EDIT BASE SKETCH / Edits the base 3D sketch. HL HOSE LENGTH / Edits hose length by changing end tangency weights. IG INCLUDE GEOMETRY / Introduces reference geometry to the route sketch. IN INSERT NODE / Inserts route node into segment. IO ISOGEN OUTPUT / Saves a file with a specified name and ISOGEN file type. MN MOVE NODE / Drags node to a new location. MS MOVE SEGMENT / Drags segment to a new location. NR NEW ROUTE / Adds new rigid piping and bent tubing routes to a pipe run. PF PLACE FITTING / Picks up a fitting from your project work space to place into the active run. RT ROUTE / Starts or continues route definition. ST TUBE AND PIPE STYLES / Copies and modifies existing style definitions and delete styles you no longer use. WT GROUNDED WORK POINT / Grounded Work Point. ORBIT FREE ORBIT / Rotates a model about the centre of the screen or about axes in model space. PAN PAN / Pans the view. VC VIEWCUBE / Toggles the view of the ViewCube. Z ZOOM WINDOW / Zooms in on a specified area.